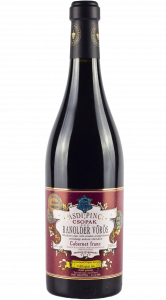 Ranolder Red is half a hectare. Complex, fruity, velvety, very long-tasting wine after sixteen months of French barrel aging. We release it at the age of four. If we send it to a competition, it wins. He has been the owner of ‘the country’s best franc’ title. Unfortunately, only a few grows so we’re glad we have it at all.